Find My Workspace lists over 95% of the serviced offices market in Fortitude Valley (Brisbane). Simply click Request Quote to check pricing for one office, or Add to Basket for multiple offices. 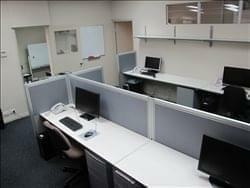 Fabulous open plan shared co-working space available in Fortitude Valley. The space is currently occupied by a building design business and structural engineer who are looking to share their workspace with other free lancers or small businesses to enjoy the shared space on a month by month basis. The office has a number of workstations available that are all fully equipped with large desks, comfy chairs and a lockable filing drawer. Other perks to the space include; access to a fast NBN Wi-FI connection, access to printing for a nominal fee, meeting room access for 6+ people, use of a fully fitted kitchen, cleaning and air conditioning. Other amazing aspects of the space include access to the on-site pool, sauna, spa, shower and BBQ area with visitor parking also available. This is a great opportunity to have access to secure office space with an alarm system, providing a professional place to meet clients without the commitment or price tag of a lock in lease. Access is available 24/7 and there is an opportunity for your business name to be on the door too. An exciting new office space offering spacious private suites, coworking and virtual office solutions alongside shared amenities such as spacious communal breakout areas including a work-bar and kitchen equipped with complimentary tea and coffee, premium meeting rooms, externally facing boardrooms with private breakout areas for you to enjoy with clients and associates, conference rooms with AV and presentation equipment, training rooms with the capacity to seat 20 people, and an outdoor deck area. There are end-of-trip facilities onsite including changing rooms and showers as well as car and bike parking so all travel methods are an option. These serviced offices are the perfect solution for a business looking for a central address and unique working environment. Focused on delivering the very best in office solutions servicing your business this business centre aims to provide a platform which allows you to focus on your business and its growth. The range of fully furnished office solutions include serviced offices, meeting rooms, boardrooms, virtual office solutions, shared workspaces and training room. The business centre, located in Fortitude Valley Brisbane, has been designed to create a comfortable and professional working environment. All offices have been furnished with the best in designer office furniture and come equipped with high speed wireless Internet. The vision of this centre is to bring alive a beautiful, character-filled building with liked-minded professionals who are passionate about what they do, and are inspired to make an impact on the clients they serve and the communities in which they live and work. Beyond living and breathing the spirit and values, the mix of tenants have been carefully considered. It is home to a complementary blend of expertise and specialist services provided by businesses that range from small to medium in size, and from start-ups through to mature. Together, the creators of the space have created a thriving business community where the spirit of collaboration creates new and unexpected opportunities. This space promotes active participation in the business and broader community by hosting and supporting events, functions and activities. Whether it is a weekly exercise or art class, group training or strategy session, or a private meeting, this space offers daily and flexible rates for the hire of their facilities. The common facilities include a fully functional kitchen equipped with coffee machine, microwave, oven, toaster, electric hotplates as well as two fridges. In the sunny outdoor areas there’s seating for meetings as well as comfortable lounging, allowing you to enjoy a change of scenery and the outdoors without truly leaving the office. To obtain information for your selected Fortitude Valley (Brisbane) Serviced Offices, please tick the "Add to basket" box for each office you prefer and complete the form below. We will then send a detailed report via email.